Dorsal stress fibers in motile cells are formed from actin filament bundles that are initiated and extended from cell-substrate adhesions at the leading edge (aka focal complexes [FXs]) (reviewed in ). 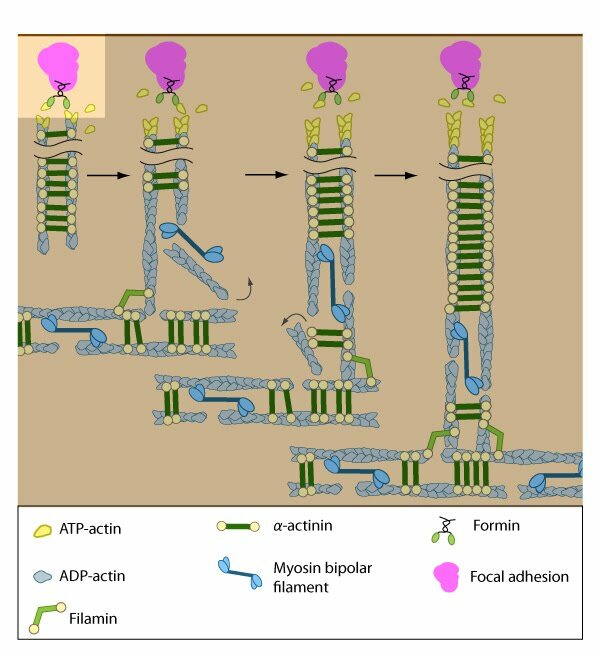 Similar to graded polarity bundles, retrograde F-actin flow from the leading edge and myosin II activity may be involved in promoting the formation w adhesions ; however, new adhesions may also form in a manner that is either force independent or requires relatively low tension . Relative to the migration of the leading edge, the cell-ECM adhesions are static . Nevertheless, stress fiber adhesion components themselves (e.g., α-actinin, vinculin, and talin ) are highly plastic and their dynamics are dependent upon mechanotransduction events (reviewed in ): as the cell body moves, FX mature into more stable and less dynamic focal adhesions by force-induced structural rearrangements that promote the exchange and addition of new components to the adhesion (reviewed in ). 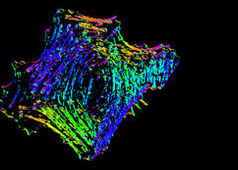 In fibroblasts, actin flow appears to cause the formation of “mini-ruffles” and microspike bundles, which may also play a part in forming the initial adhesions found in dorsal or ventral stress fibers . Inhibition of focal adhesions assembly blocks stress fiber formation in general . Initiation is triggered by the activation of adhesion molecules, such as integrin, and the tension-dependent recruitment and activation of the Rho family of GTPases, including Rac1 (reviewed in ). Rho GTPases promote signal transduction cascades and interact directly with components of the actin polymerizing module to initiate actin filament assembly. Actin filaments in dorsal stress fibers are primarily initiated by formin-mediated nucleation (e.g., mDia1) (figure adapted from ). Rac1 activity strengthens the nascent adhesion by promoting both the assembly of scaffolding proteins and the recruitment of actin-binding proteins to the adhesion site. 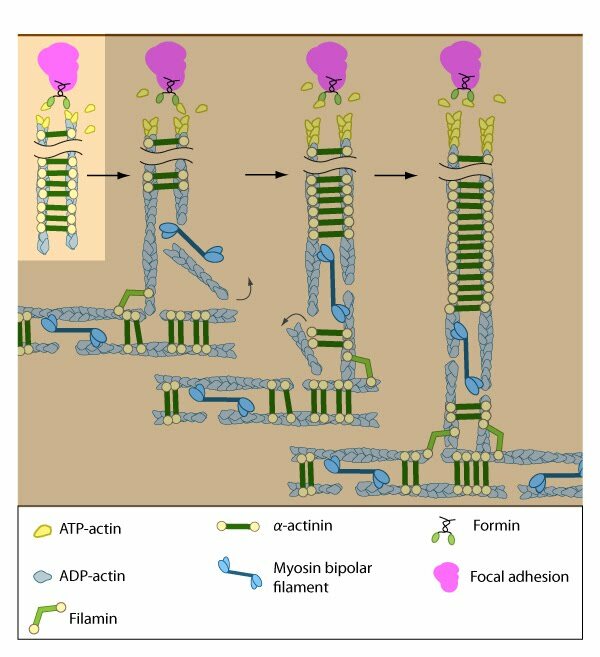 Although the initial polymerization of actin filaments from adhesion sites is regulated by all Rho GTPase family members (e.g., Rac1, RhoA, Cdc42) , protein recruitment and stress fiber assembly is primarily modulated by signaling cascades involving RhoA  (reviewed in ). The short unipolar actin filaments in dorsal stress fibers are polymerized and elongated from focal adhesions via a formin-dependent mechanism (e.g., mDia1/DRF1) . This leaves the barbed ends of the actin filaments directed towards the adhesion (reviewed in ). The enzymatic activity of Rac, Rho, and their effectors (e.g., ROCK) is necessary to recruit formins to focal adhesions, where they are thought to play a vital role in creating a stable pool of cortical actin and in maintaining free filament barbed ends . The elasticity of formins at focal adhesions may be tied to their mechanosensing ability, as suggested by increased force-induced actin polymerization at these adhesive sites . Several studies also show that actin filament bundles in filopodia can serve as precursors of dorsal stress fibers or graded polarity bundles . Certain groups that did not observe actin polymerization during stress fiber formation have suggested that stress fibers may form as a result of F-actin stabilization brought about by filament bundling and merging . Stress fiber assembly at focal adhesions is thought to occur by a general mechanism irrespective of the cell type . The nascent adhesions continue to grow and exchange components. Nascent unipolar actin filaments are extended and they are stabilized by actin binding proteins (e.g., α-actinin, filamin). The population of filaments are crosslinked into bundles and they steadily exchange actin subunits as they move towards the cell body due to retrograde actin flow and actin treadmilling. The orientation and polarity of the filaments may become mixed as they are transported (figure adapted from ). Once a nucleus of short actin filaments has been initiated from the focal adhesions by formins, elongation occurs in a centripetal direction (towards the cell body) and the filaments are rapidly bound and stabilized by α-actinin . 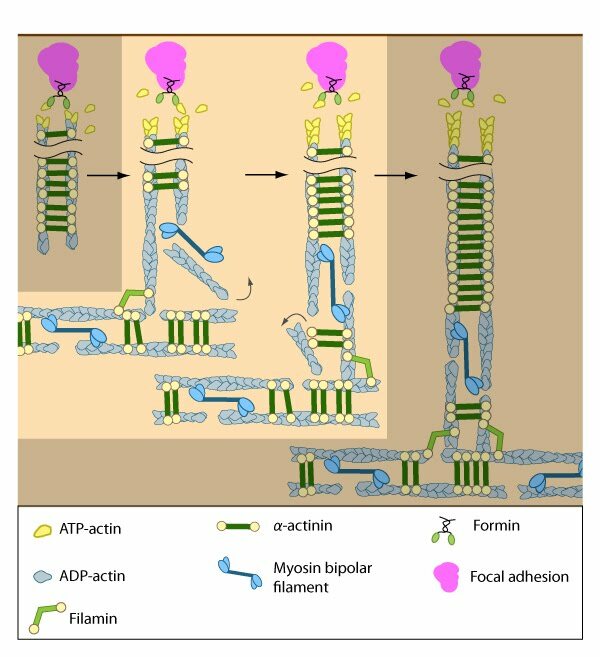 α-actinin not only crosslinks the filaments into small bundles, but also fortifies the bridges between the cytoskeleton and the plasma membrane through its interaction with adhesion receptors (e.g., integrins ). Immature actin bundles in spreading cells have the focal adhesion proteins, vinculin and paxillin, not only at their ends but also along the entire length of the actin filaments . Similar to other cortical actin networks that are composed of actin bundles (e.g., microvilli, stereocilia), the elongation of filaments from the base of the adhesion would presumably contribute to the retrograde flow of actin away from the adhesion and promote the condensation of the dorsal fiber into larger bundles as they are moved towards the cell body . The filament orientation may also change despite the adhesion site remaining stationary relative to the substrate . Dorsal stress fibers can also be connected to transverse arcs in the cell body where the transverse arcs filaments are suggested to continuously supply the dorsal stress fibers with actin filaments . 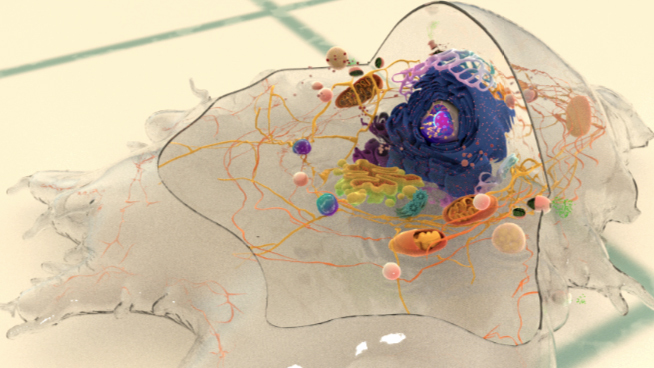 Precisely how this is achieved, is unknown (reviewed in ); however, it likely involves actin binding proteins and myosin motor activity. Interestingly, the assembly of dorsal stress fibers and transverse arcs appears to be connected: transverse arcs encounter dorsal stress fibers as they are transported towards the cell body via cell-wide actin-myosin contractions . Dorsal stress fibers (DSF) appear to contact transverse arcs at their proximal ends towards the cell body. DSF are thought to ‘feed’ the transverse arcs with filaments of mixed polarity. 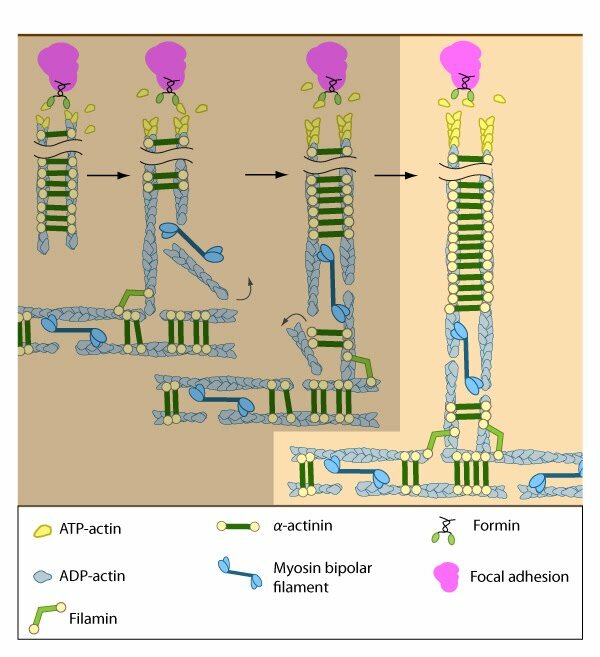 Although myosin II bundles are generally absent from DSF, occasionally they will displace α-actinin and become incorporated towards the proximal end of DSF (figure adapted from ). The unipolar filaments in dorsal stress fibers are typically non-contractile (at least in the human U2OS bone cell line); however, because their proximal ends are connected to transverse arcs, myosin II is occasionally incorporated into the ends of the DSF, simultaneously displacing α-actinin in this process . The connection to transverse arcs and maturation of elongating dorsal stress fibers (in terms of length) seem to be prerequisites for the incorporation of myosin into dorsal stress fibers . Transverse arcs are also thought to continuously supply dorsal stress fibers with actin filaments as they retract centripetally (reviewed in ). Exactly how transverse arcs filaments are fed into dorsal stress fibers is unknown, but based on experiments using purified components , mathematical models, and live cells , it has been suggested that myosin bundles may recruit the filaments and facilitate polarity sorting  (reviewed in ). In line with this concept, factors that regulate myosin bundle formation (e.g., myosin light chain kinase , Rho-associated kinase ) or their binding to stress fiber actin filaments (e.g., tropomyosin ) will likely contribute to incorporation of dorsal stress fibers. Although transverse arcs are not connected directly to focal adhesions, the contractile tension generated by transverse arcs presumably can be transmitted to the cell surface and transferred to the substrate through the dorsal stress fibers; whether this predicted force transmission actually leads to extracellular remodeling, is relatively unexplored.